Jan 29 I heart cookies. I heart you! I really think food speaks volumes both about us and our lives, and the people in our lives.When a friend is sick: you bring food. When you are sick: you eat homemade chicken soup. When you are really sick: you are sad you cannot eat food. When you are sad: you eat comfort food. When you are comfortable: you make new food. When you are new: you eat familiar food. When you are familiar: you try weird food. When you are rushed: you eat okay food. When you go to bed: you sneak food. When you are busy: you forget to eat food. When you invite friends over: you make good food. To show you care: you bake food. To help a neighbor: you loan food. To cheer a friend: you bring decadent food. I was paging through my calendar today, noting each square and the piles of words, eraser marks, changed plans, kids' school activities, business meetings, friend greets and doctor visits. We have tours scheduled, one on top of another, to decide the next scholastic pit stop for my boys. There are visits from relatives, soccer games, might-happen ski trips and the occasional field trip. Business travels, parent conference, friends' birthdays and the sketchy remnants of physical activity (I swam last week, didn't I?). You get the point---you have a calendar too. But what about this idea: a calendar with only food. What I ate for dinner, or made for dinner. Who did I cook for? What traversed my table-top on a lavish dinner-out or a buzz-by dinner in? What did I shove down the throats of my children on our way out the door? Did I eat leftovers for lunch? Did I create a disguise for the leftovers? Was that meal humming with flavors and balance and ceiling high flavors? Would I ever bother make it again? Was that wine a boring compliment or a meal-maker? Who did I eat with? Was it perhaps you: eating while blogging/online/emailing. I am culprit. So when I look at my calendar it talks of food: the good, the bad, the quick and slow. The friend, the neighbor, the gift to the teacher. The planned for, spontaneous and practical food---or the familiar and not so familiar food. If new, it is rated and marked and, if worthy, its recipe stated. Yesterday afternoon, a leisurely stay-home Sunday was impetus for me to make orange vanilla ice cream, mint simple syrup, heart shaped cookies, some health bars, sauteed corn, and roasted potatoes with fennel. What story does that tell? Heat oven to 375. Mix/beat first 6 ingredients. Mix in flour and salt, then food coloring. Refrigerate dough if desired, for easier shaping. Otherwise, roll dough into log, shaping into heart and slicing in 1/2 inch slices. 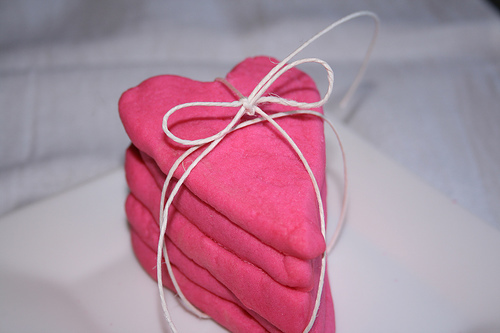 Bake heart cookies 9 minutes. And that was just one afternoon! Most days aren't that industrious, but then again any given week I might be gallivanting through a few new recipes, rushing around from A to B, or planning meals for a family in need. Go ahead, for a week paint your life by the food you eat. What story will the food tell? What busy schedule or sad moment or big event or friendly meal colored your week? What story is woven, and captured, by the food that crosses your table and your palate? Today my food speaks: I heart cookies. I heart you!